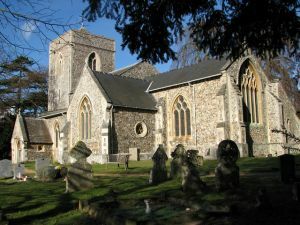 The church of Holy Trinity dates to at least the early 13th century, though some sources suggest a mid-12th-century date. The building is composed of an aisled nave, chancel, south chapel, north sacristy, south porch, and west tower. The tower and sacristy are the oldest parts of the building. The church is built of stones with ashlar dressing. The interior is of interest for several medieval funerary brasses. In the chancel are brasses to Henry Paris (d. 1466) and Robert de Paris and his wife (early 15th century). A further brass dating to about 1530 shows a skeleton wrapped in a shroud. Hildersham church used to house a pair of 14th-century wooden effigies thought to represent William Busteler (died c. 1334) and his wife, but these were unfortunately stolen in 1977 and never found. There is also an octagonal 13th-century font, but despite these medieval and Elizabethan items, the primary interest at Hildersham is probably the extraordinary Victorian wall murals in the chancel. During the 19th century, the Goodwin family supplied Hildersham with rectors from 1806-1900. Under the direction of the Goodwins Holy Trinity was gradually restored and rebuilt in the then fashionable Victorian Decorated style. Whether the result is appealing or not is open to individual taste! In 1890 the firm of Clayton & Bell were brought in by Robert Goodwin to paint the chancel, which they did in an ebullient, ornate style, including a striking depiction of the Entry into Jerusalem over the vestry door. The interior is lit by vividly coloured Victorian stained glass throughout, lending a very rich colour to the interior.